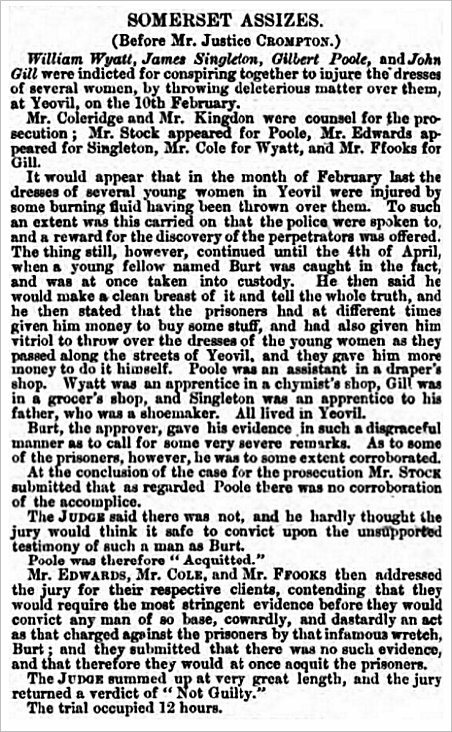 "William Wyatt, James Singleton, Gilbert Poole and John Gill were indicted for conspiring together to injure the dresses of several women, by throwing deleterious matter over them, at Yeovil, on the 10th of February. Mr Coleridge and Mr Kingdon were counsel for the prosecution; Mr Stock appeared for Mr Poole, Mr Edwards appeared for Singleton, Mr Cole for Wyatt, and Mr Ffooks for Gill. It would appear that in the month of February last the dresses of several young women in Yeovil were injured by some burning fluid having been thrown over them. To such an extent was this carried on that the police were spoken to, and a reward for the discovery of the perpetrators was offered. The thing still, however, continued until 4th of April, when a young fellow named Burt was caught in the fact, and was at once taken into custody. He then said he would make a clean breast of it and tell the whole truth, and he then stated that the prisoners had at different times given him money to buy some stuff, and had also given him vitriol to throw over the dresses of young women as they passed along the streets of Yeovil, and they gave him more money to do it himself. Poole was an assistant in a draper's shop, Wyatt was an apprentice in a chymist's shop, Gill was in a grocer's shop and Singleton was an apprentice to his father, who was a shoemaker. All lived in Yeovil. Burt, the approver, gave his evidence in such a disgraceful manner as to call for some very severe remarks. As to some of the prisoners, however, he was to some extent corroborated. At the conclusion of the case for the prosecution Mr Stock submitted that as regarded Poole there was no corroboration of the accomplice. The Judge said there was not, and he hardly thought the jury would think it safe to convict upon the unsupported testimony of such a man as Burt. Poole was therefore Acquitted. Mr Edwards, Mr Cole and Mr Ffooks then addressed the jury for their respective clients, contending that they would require the most stringent evidence before they would convict and man of so base, cowardly, and dastardly an act as that charged against the prisoners by that infamous wretch Burt; and they submitted that there was not such evidence, and that therefore they would at once acquit the prisoners. The Judge summed up at very great length, and the jury returned a verdict of Not Guilty. The trial occupied 12 hours." The report of the affair in the 13 August 1859 edition of the Salisbury & Winchester Journal.